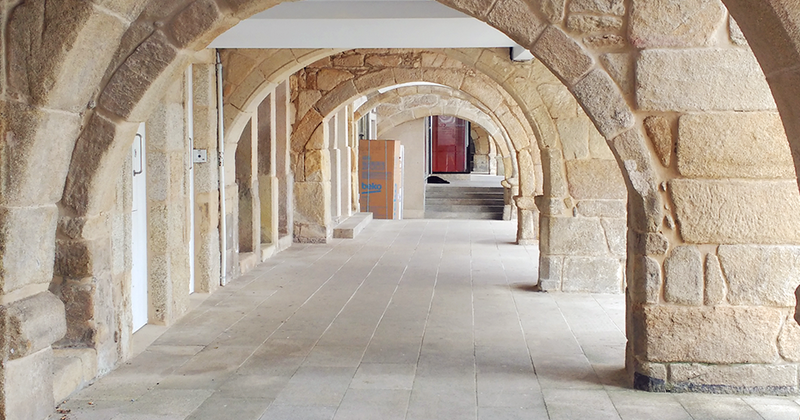 It is one of the most beautiful and well cared for historic centres of Galicia and, at the same time, one of the best kept secrets of the Community. Dividing the maritime terrains between the Costa da Morte and the beginning of the Rías Baixas, Muros is one of the most pleasant towns in which to stroll and marvel. Drinking something in the shadow of a lofty building, eating under the arches of an old seafaring house or discovering traces of modest modernism are pleasures that can be enjoyed in this coastal town. Because Muros is a completely sea-oriented town. Built on the side of a mountain, in a natural inlet within the estuary of Muros and Noia, ships have sought shelter here from the fury of the Atlantic since ancient times . It is said that it was founded in the thirteenth century by King Sancho IV,and the Santa María do Campo parish church was built around that time. The façade is still the original one, Romanesque. The interior, dating back to the fifteenth, is really noteworthy: built in the so-called marine Gothic style, it attracts attention because of its spacious interior, illuminated by a rose window and windows with pointed arches. Muros was declared a Historic Site in 1970 precisely because of the accuracy with which it preserves the medieval and marine urban frame. An essential activity for visitors is getting lost in the old town. It is not a difficult task: the narrow streets, the dead ends, the luminous squares follow one another in a manner arranged by the centuries. Fortunately, it is very easy to turn towards the sea and find your way again. The part of town that faces the port is characterized by the arches typical of marine houses, which in Muros are almost always pointed and support one or two stories with long or forged balconies. Scattered around the old town are several buildings of the early twentieth century in which you can see the modernist footprint: galleries, lathed windows, old cinema façades, the Market and details on the fronts that contrast sharply with the sober religious architecture of the town’s various churches. The port is omnipresent, and its facilities practically surround the urban centre. Thus, the sailors’ work is part of the daily show lived in this place. Muros is the capital city of a municipality that traditionally lived from the sea and now welcomes, especially in summer, hundreds of tourists, attracted by the coast’s spectacular beaches. Esteiro, Louro, Serres… Each of these small towns is squeezed between the busy road and the sand, well sheltered from the waves. The landscape’s outline can be easily seen by climbing to the highest parts of the municipality, around the mountain of Paxareiras, where the persistent winds turn the windmills’ blades. Although, when it comes to mills, one must not forget tide mills, which went through tremendous development here a little over a hundred years ago. In Serres one of them, known as Pozo do Cachón, has been restored to showcase how these facilities operated, designed to take advantage of the force of the water where rivers reached the sea.